When I first started learning to cook I was pretty religious about sticking to my recipe. Learning a new skill can be stressful, and nobody wants to put hours into a meal only to have it turn out badly. So I’d bounce between the stove and my cookbook or the computer, the sink, and my cutting board – like a chicken with her head cut off, which made it kind of hard to enjoy the process. After a little while I started to notice patterns in the recipes I used the most, and understanding those patterns has made me a much more confident, relaxed, and competent cook. I no longer feel bound to a recipe and can add or subtract ingredients without worrying if it will ruin my dish. It’s changed me, I tell you, and I want you (everyone! all of you!) to be able to do the same. This little series, which I’m calling “foundations of flavor” will be devoted to demystifying recipes a bit, and I hope it will make you feel a little less tethered to your cookbook. The first pattern I noticed was that my recipes always started with vegetables. Even the meat-centric recipes asked me to begin by chopping rabbit food. Not only that, but the recipes usually started with some combination of the same seven vegetables, namely: onion, garlic, celery, carrot, pepper, ginger, and scallion. You can also get through a lot of Chinese and Indian recipes with scallion, ginger, and garlic, and every single Latin country has their own distinct version of sofrito based on these same ingredients (with the addition of some chiles). What’s cool about these vegetables is their insane versatility and ability to play together so well, in so many unique ratios and combinations. They’re also pretty much the cheapest veggies in the produce section. I probably have at least five of them on hand at any given moment. You’ve used these vegetables before. You’ve probably made mirepoix and sofrito many times, but maybe you didn’t realize it because you didn’t know the name or reason. 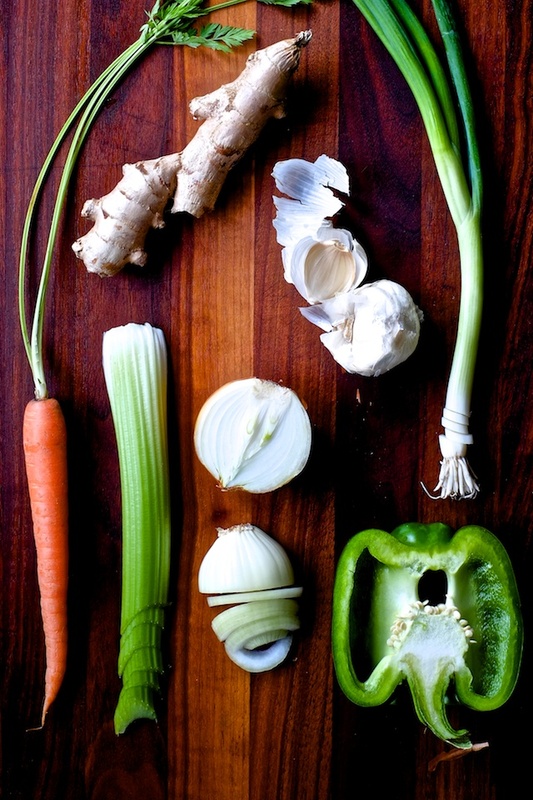 These flavorful vegetables are important to good food, like underpinnings to an evening gown. When used properly you might not notice them specifically, but their absence would be immediately apparent and problematic. They are what take a soup from flat to full or a sauce from insipid to enticing. They are the supporting layers that add nuance and complexity to every good dish. And now that I’ve beat that weak metaphor to within an inch of it’s life, you understand. If you want to turn broth into soup, add mirepoix (and maybe some noodles). If you want to turn tomatoes into sauce, add batuto and olive oil. If you want to make beans taste like dinner, add sofrito. Go forth, and cook.